Aside from my somewhat unhealthy addiction to raw fish this salad is my favorite part of going out for sushi. Unlike procuring good-quality raw fish, this salad is really simple to prepare at home. It gets even better when left to mellow in the fridge for a day. Slice cucumber spears into paper thin slices using a knife or the slicing blade of a cuisinart. Cut nori into thin strips. 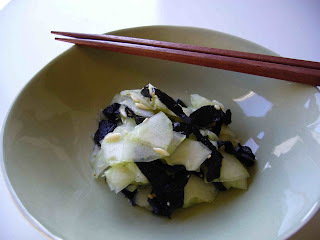 Mix nori and cucumber with vinegar and sesame seeds. Seasoned rice vinegar is just sweetened rice vinegar so if you can't find it, add 1 t sugar to rice wine vinegar before mixing in with the other ingredients. Let mellow in the fridge for a day and enjoy! Hey...thanks for stopping by my site. The shrimp toasts were pretty simple to make. Also, since I see you're trying to be healthy (I try but usually fail), I think these can be modified for baking. Just brush them lightly with canola oil, bake at 375 for about 10 min, or until the shrimp mixture looks firmed up, then switch to broil to get them golden. Probably not as crispy but I think I'll try it next time. LOVE this cucumber salad idea. I think I might have all the ingredients at home. Will be trying it soon! I saw you on the foodie blog roll...hope you don't mind me stopping by. The cucumber salad looks fantastic. I could live on sushi and salads...so I'm going to make this as a side for dinner tonight. You're blog is great!